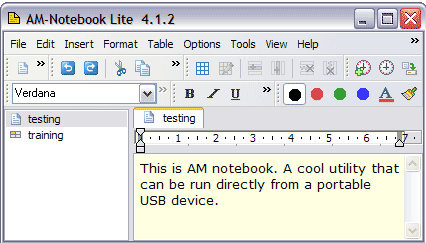 AM-Notebook is a portable application that allows you to create notes, encrypted notes and spreadsheets, access your address book and more all using one single tool. It also utilizes a built in alarm clock that can be used to notify you of important events. It can be installed to a USB device such as a flash pen drive and once launched, AM Notebook can be accessed directly from the system tray (near the clock).